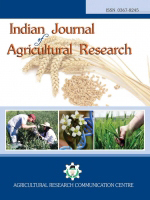 The present study was undertaken to assess the response of common bean under drought in respect of root traits and biomass partitioning in fifteen common bean genotypes. The basal root whorl number and the number of basal roots was highest in case of WB-185 and lowest in case of SR-1, whereas, the basal root growth angle was highest in case of WB-258 and lowest in case of WB-249. Rooting depth measured as the length of longest root harvested was highest in case of WB- 6 (66.2) while as lowest value was recorded for WB-112 (20.4). Dry root weight was highest in case of WB-216 (0.45) and lowest value was recorded for WB-341 (0.22). Similarly leaf biomass was highest in case of WB-6 (0.58) followed by WB- 216 (0.58) and the lowest value recorded for WB-1186 (0.12). Shoot dry weight was highest for WB-6 (0.55) followed by WB-216 (0.44) and the lowest value recorded for WB-1186 (0.118). Pod dry weight was highest for WB-489 (2.28) followed by WB-216 (2.19) and the lowest value recorded for WB-83 (0.68).489. Root biomass proportion was highest for WB-195 (18.34) and lowest for WB-489 (10.00). Similarly leaf biomass to total biomass was highest in case of WB-83 (23.19) whereas lowest value was recorded for WB-1186 (7.60). Highest stem biomass proportion was recorded for Arka Anoop (19.19) and the lowest value was recorded for WB-1186 (7.591). Biomass allocation to pods was highest in case of WB-489 (69.92) followed by WB-1186 (68.69) whereas lowest value was recorded for WB-83 (45.40). Biomass Allocation, Common Bean, Drought Stress, Root Traits.